Double exposure and Sandwiching by John Neville Cohen. Double Exposure - Projector Style! The accidental double exposure happens to most photographers sooner or later, although perhaps it is not so common with the newer foolproof cameras of today. It can be very annoying, when two perfectly good photographs have both been ruined, by being exposed one on top of the other. For some photographers it is a deliberate attempt to create something interesting, but then so much guesswork is involved. There is a reliable method using a mask on the camera lens, that stops first one half and then the other half of the frame from being exposed, so that two scenes can be combined in the middle. Otherwise there is little real control of the end result with these double exposures. When sandwiching films in this manner it is possible to insert one or the other upside down, on its side, or the other way round. Plate 22 (above) was created in this sandwiched way. 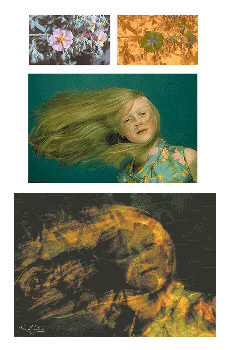 The transparency of Debra with her hair flowing, or so it appears, was actually taken with her lying on her side and the hair hanging down. By placing this image horizontally instead of vertically her hair now appears to be blowing in the wind. The other picture sandwiched with her is a negative taken of some rockroses. There is little more opportunity with this technique of controlling the end result, so it is only a little bit better than double exposure as at least one can see what the result looks like first.